Adjustable shoulder strap for carrying by shoulder or cross-body style. Open & hasp closure for convenient and safety. 5 different colors available: Brown Black Red Blue and Pink. Perfect tote bag for lady with excellent workmanship. Faux Suede also applied to the side and front of the bag for unique. Narrow shoulder strap shows exquisite and lady. 1 open pocket (for regular sized phones) and 1 zipper pocket for security in two sides. Special design: the internal fabric can be pulled out for easy cleaning. DIMENSIONS: 9.4" L x 3.0" W x 8.0" H; Strap height: 40.5-43.3". FUNCTIONAL TOTE BAG FOR WOMEN: 1 main big pocket, 6 open pockets and a zipped pocket, suitable for daily-use,very practical and easy storage. EASY USE SADDLE PURSE: Both Cover and hasp closure boho purse with long adjustable strap for safety and convenient. 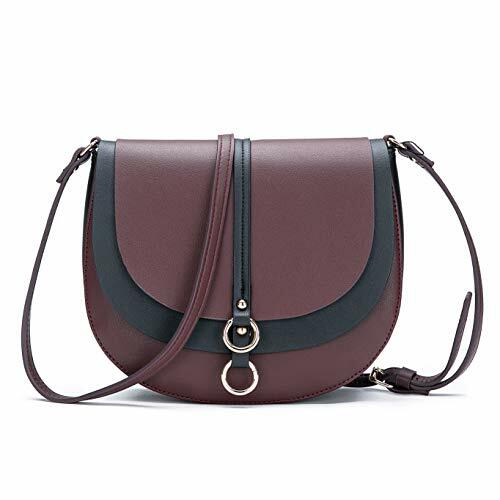 HIGH QUALITY BROWN CROSSBADY PURSE: Perfect PU fabric for the vintage small blue handbags and Faux Suede Patchwork with excellent workmanship, cute and fashion red pink black pu leather purse. If you have any questions about this product by AFKOMST, contact us by completing and submitting the form below. If you are looking for a specif part number, please include it with your message.